Createspace Independent Publishing Platform, 9781537324227, 150pp. 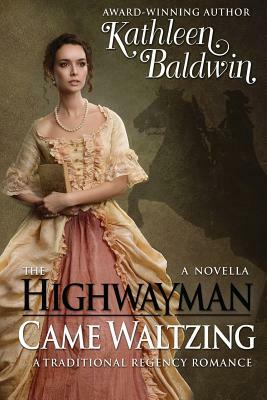 The Highwayman Came Waltzing by Kathleen Baldwin is a whimsical visit to the world of thieves. These highwaymen are not at all what one might expect. When Elizabeth's childhood sweetheart returns from the Napoleonic wars to investigate a series of robberies in Claegburn Woods. She never dared dream their shared waltz would rekindle their affection for one another. But she knows loving Lord Ryerton is impossible, because Elizabeth hides a dark and dangerous secret. This improbable tale is written solely for your delight and enjoyment. Should you happen to crave more information about the highly romanticized, sometimes brutal truths behind the real highwaymen of myth and legend, please visit Kathleen's website. Until then, take a deep breath; close your eyes to harsh realities, and stroll into Claegburn Woods where the moon rides high and the owls are hunting on silent wing, there we will enter the lives of a rather unusual band of Robinhoodlums. This novella is a tipping of the hat to Alfred Noyes. Oh, what silken dreams were spun on the wheel of his romantic poem, The Highwayman. If you leaned out the window with the innkeeper's daughter and sighed over the dashing highwayman, this is a story for you. Several verses are echoed in the chapter headings, and the complete poem is available at the end of the book. "I love adventure in books and in real life. I've roamed the Rocky Mountains, wandered the desert, enjoyed way too many classes in college, was stalked by a mountain lion, lost an argument with a rattlesnake, fell in love at least a dozen times, finally met and married my very own hero, and together we've raised four free-spirited children." Award-winning author - Kathleen Baldwin has written several award-winning Regency romantic comedies for adults. A SCHOOL FOR UNUSUAL GIRLS is her first historical romance for Young Adults. It is a Junior Library Guild selection, received a starred review from Kansas NEA 'best of the best' for High Schools, and is a 2016 Spirit of Texas book. EXILE FOR DREAMERS is the second book in Stranje House series. Scholastic licensed both for book fairs. Ian Bryce, producer of Spiderman and Saving Private Ryan, optioned the series for film.